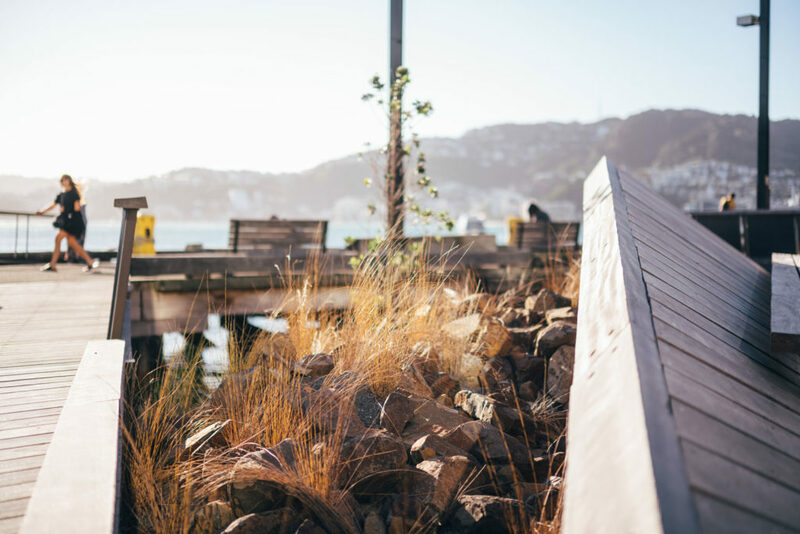 Straddling active fault lines and blasted by ocean winds funnelled through the Cook Strait, Wellington is, by necessity, a resilient city that nestles into steep hills girded with a green belt of vegetation. 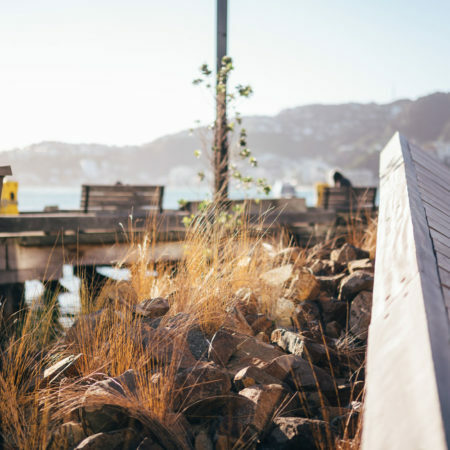 Where sea meets land there was once a fishing kāinga (village), Kumutoto, named after an ancient stream that makes its escape to the sea. 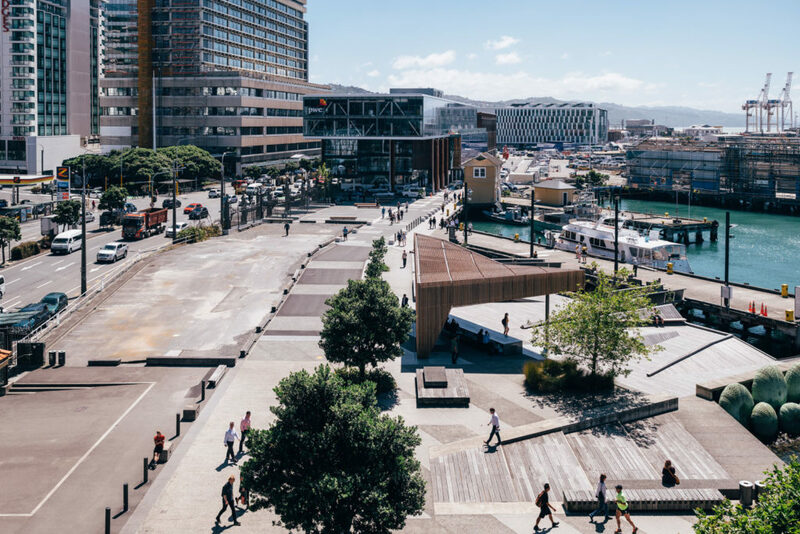 Since the late 1980s, with port operations relocating, Wellington’s city centre has begun to swing back to the harbour. 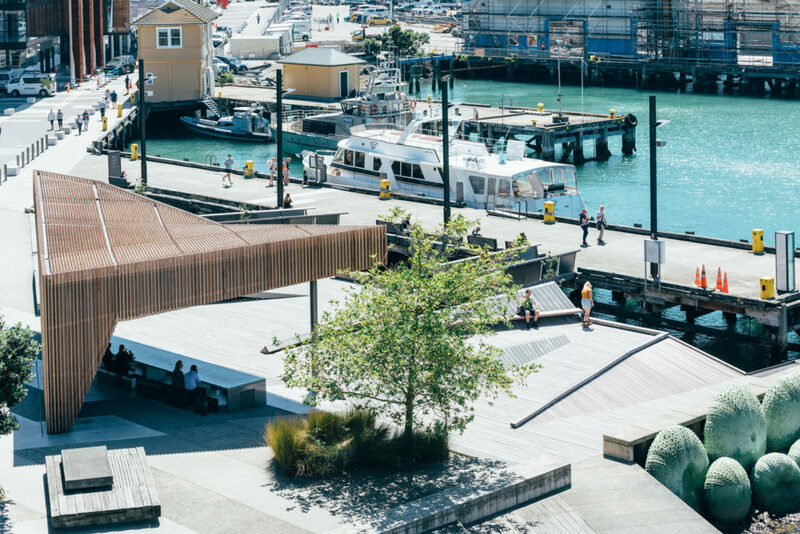 The Kumutoto precinct, on the waterfront of New Zealand’s capital, was until recently covered in surface car parks. 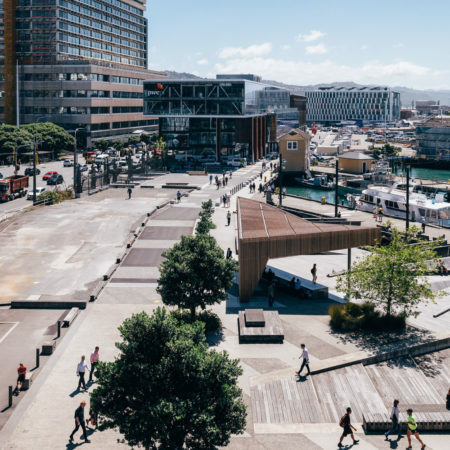 Its transformation into a precinct of contemporary mixed-use buildings and public space is composed of two key spatial moves: pushing the city out and letting the sea in. 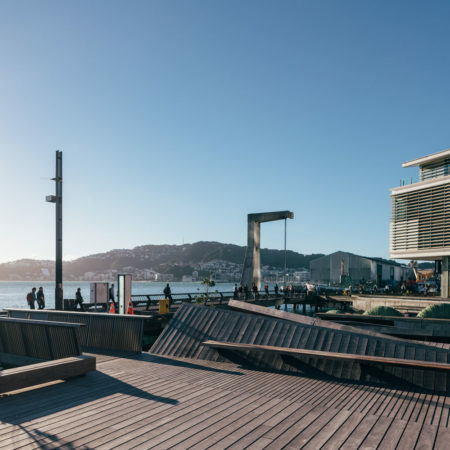 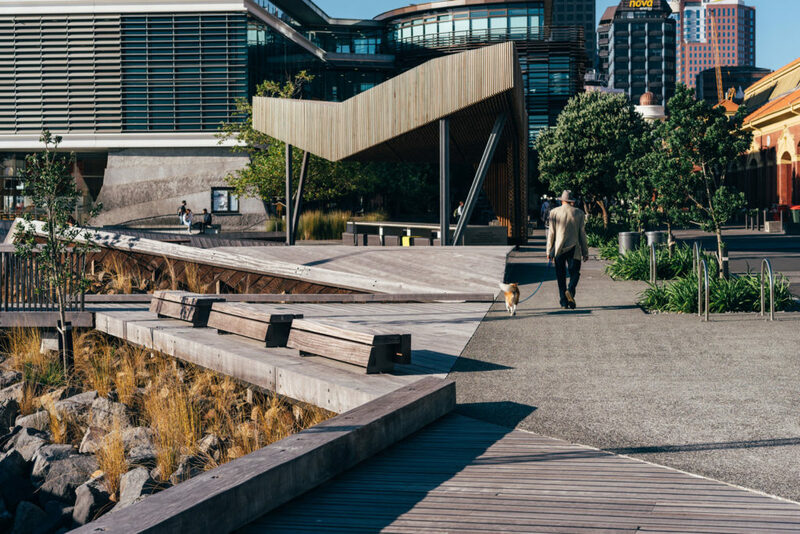 The Kumutoto project extends Wellington’s grid down to the coastal edge and provides new pedestrian connections –it also ‘declaims’ the buried mouth of the Kumutoto Stream, once lost to the city, letting the sea in and giving people a place in which to enjoy sky meeting the sea. 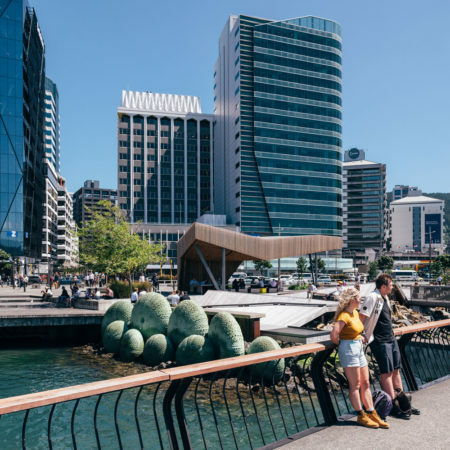 The North Kumutoto development was catalysed by the construction of premium waterfront real estate, resilient new mixed-use buildings, base isolated for protection against the next major earthquake. 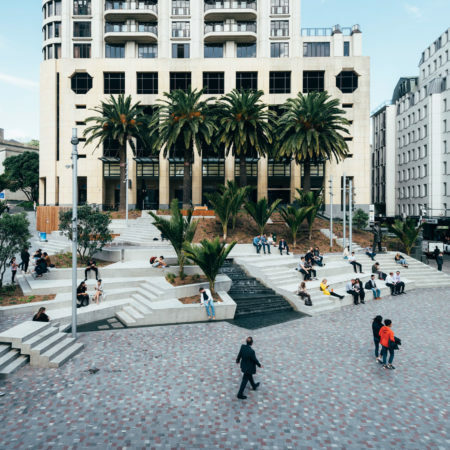 The design for the public realm of this precinct emerged out of a deep understanding of the place, it’s people and its culture. 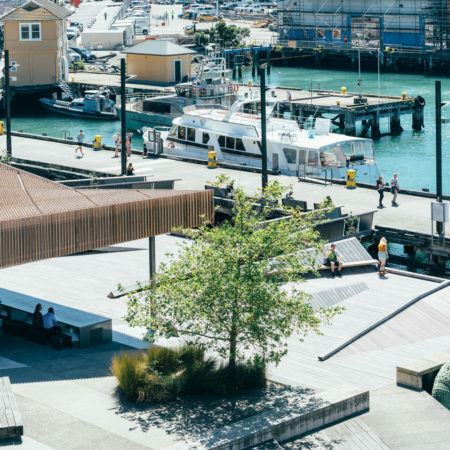 While the heavy port operations have long since gone, Kumutoto is still a working waterfront with harbour ferries and pleasure boats regularly berthing on the wharf. 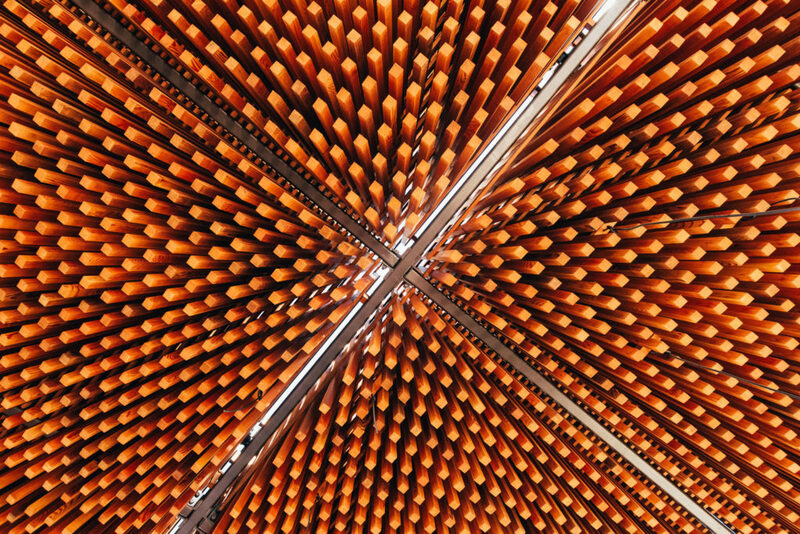 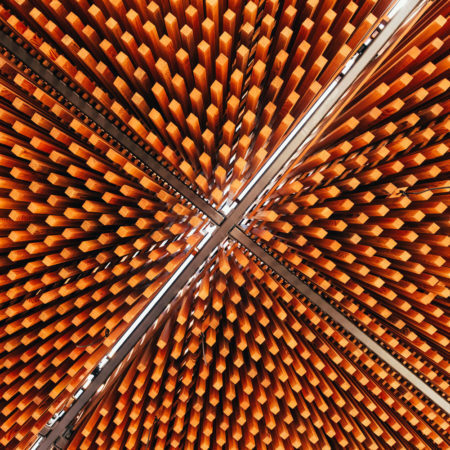 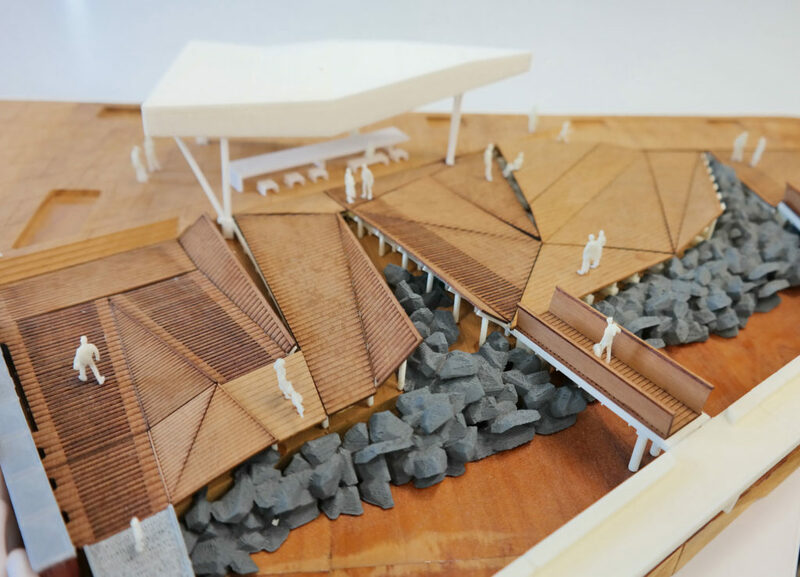 The materials and elements of Kumutoto are necessarily robust and simple in response to their function. 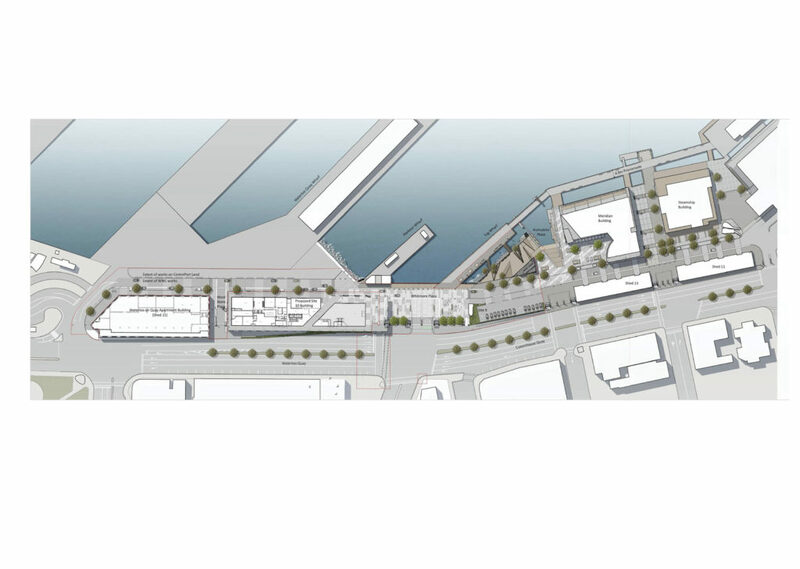 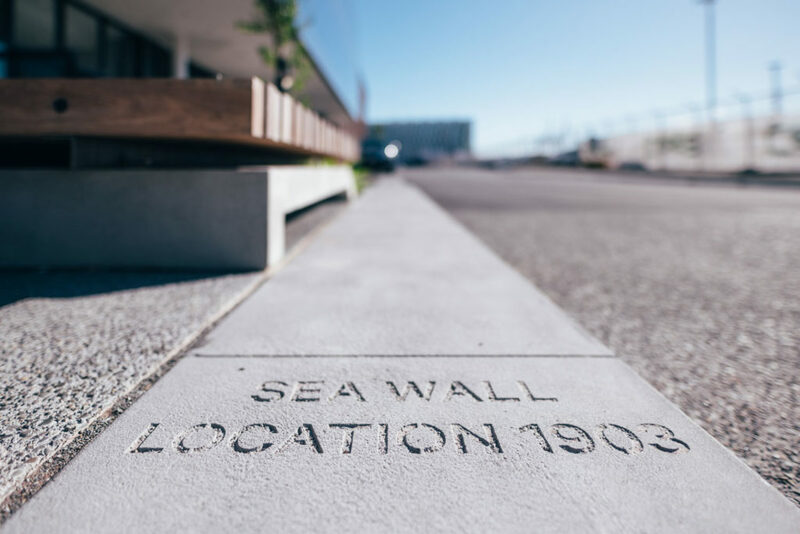 The design process involved mapping the traces of the historic shoreline, land reclamations and sea walls as well as the footprints of buildings that previously stood on the waterfront. 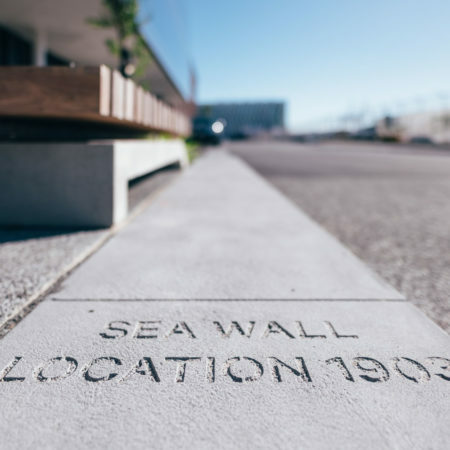 A new laneway traces the historic 1903 sea wall past the new commercial buildings, while the original footprint of long demolished Custom House has been drawn within the granite paving. 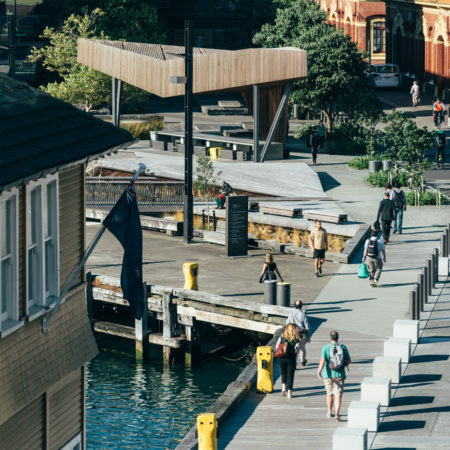 All of the heritage port fences and gates have been restored and retained in their original configuration, albeit the gates are open and the public today is welcomed in. 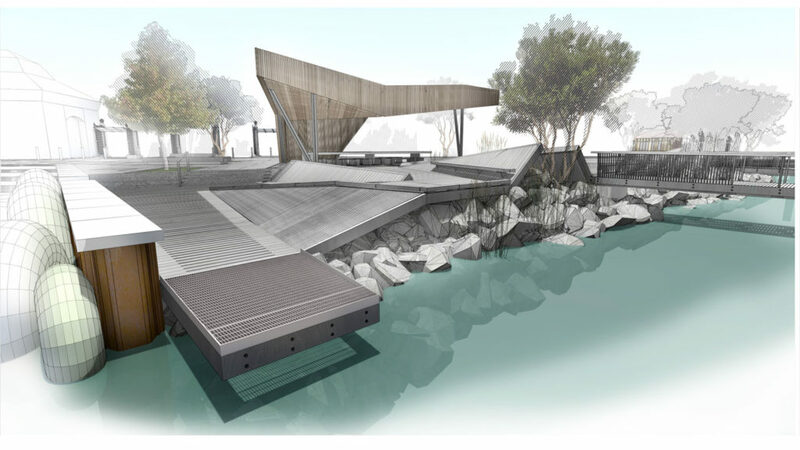 Hinging off the laneway at the water’s edge, a triangular open space explores the interaction between water and land. 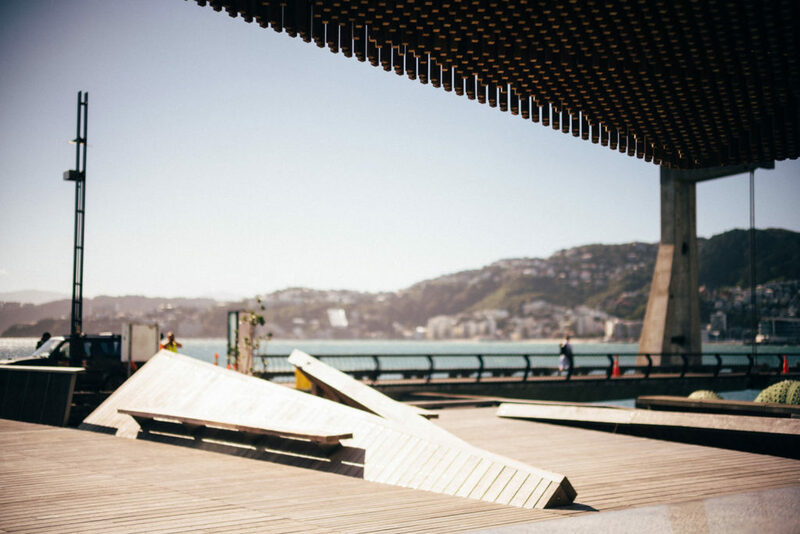 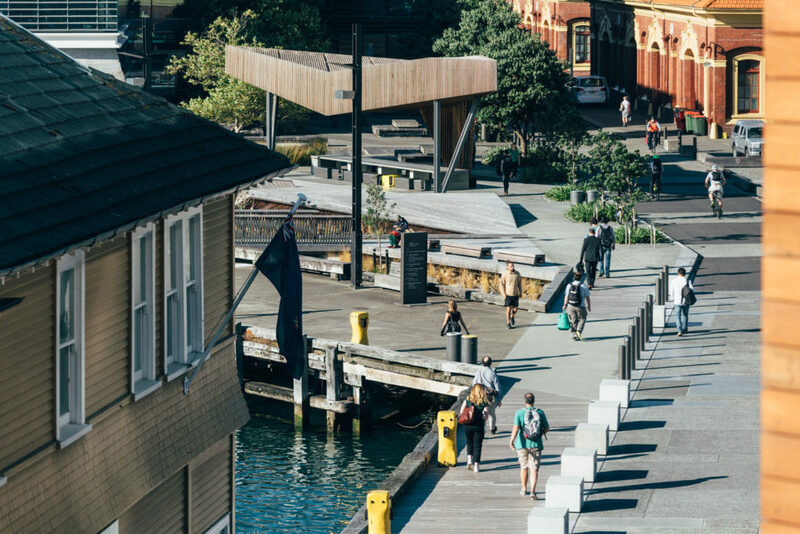 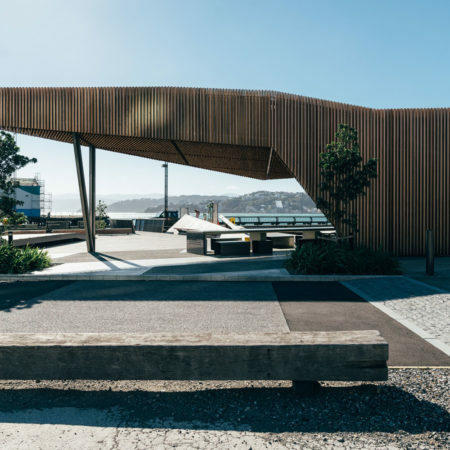 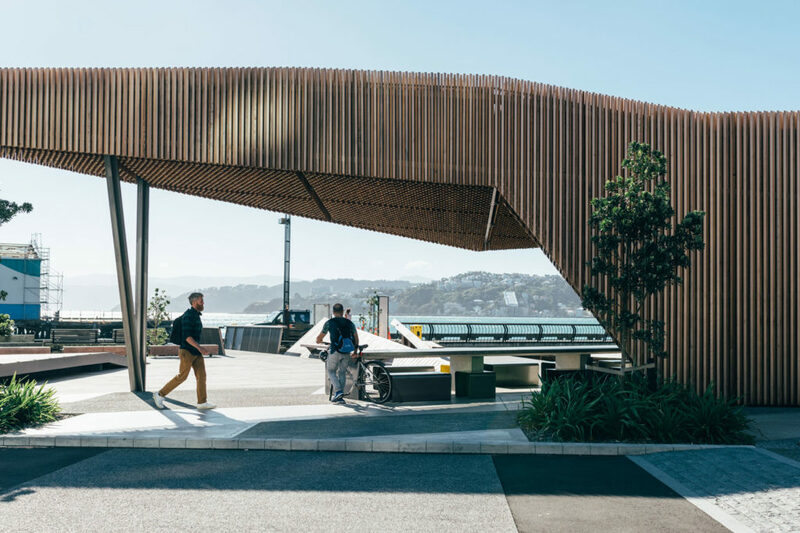 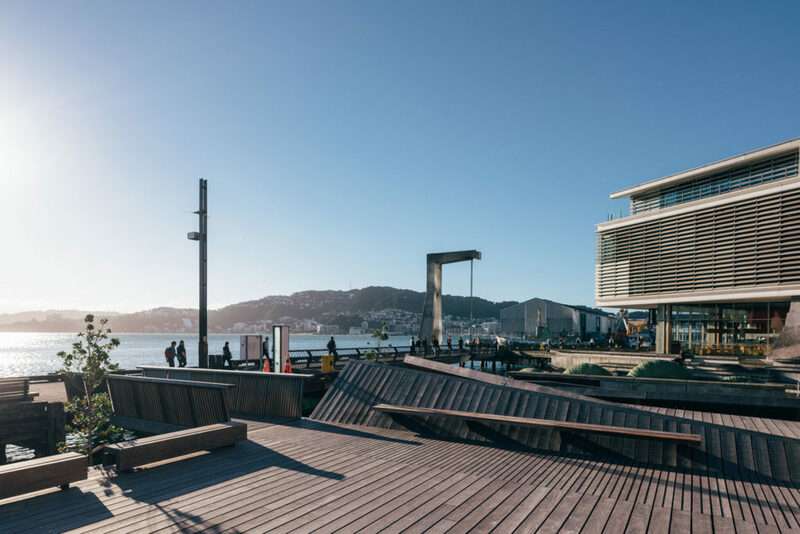 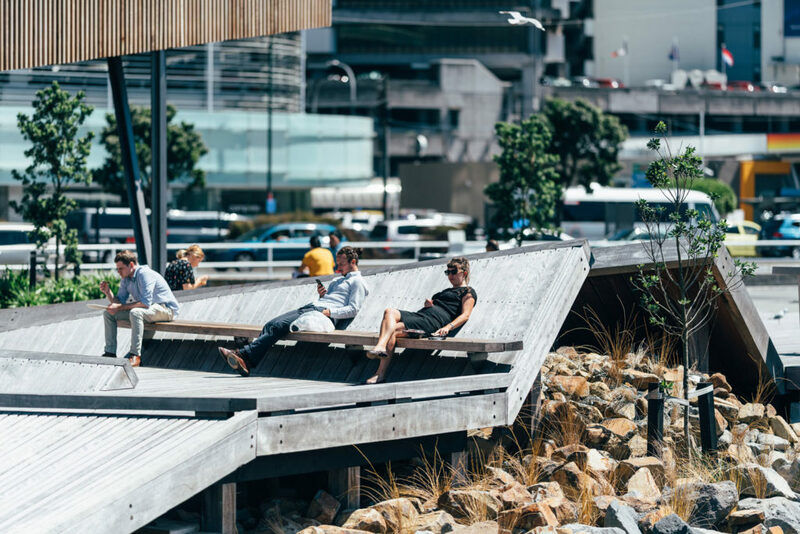 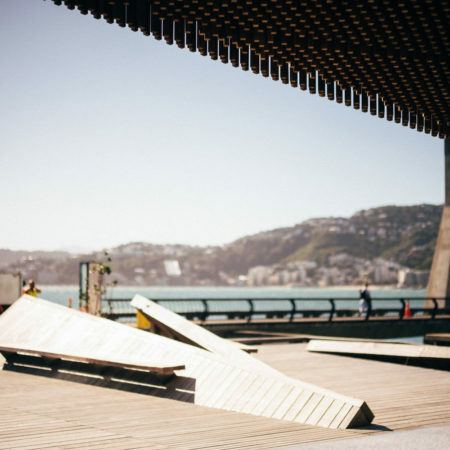 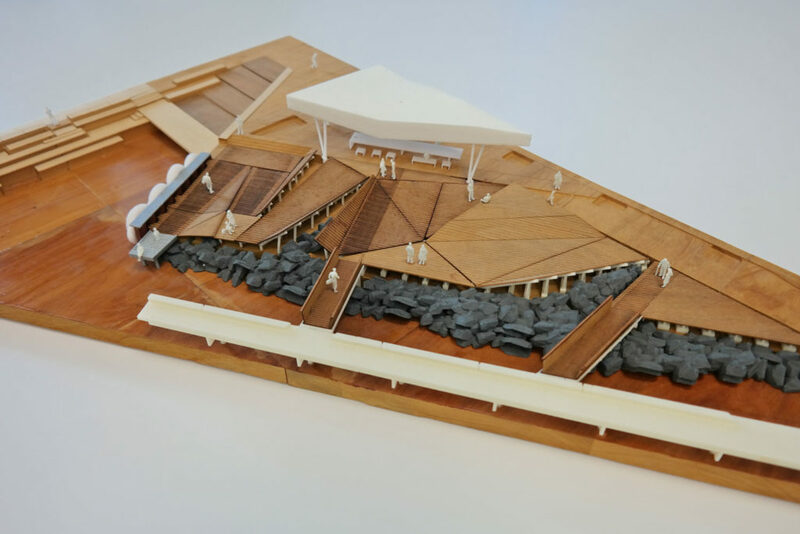 Conceived as a reinterpretation of Wellington’s wharves, the public space folds and ‘floats’ above the coastal edge to create habitats for people as well as native flora and fauna including the kororā (little blue penguins) who nest in the gaps between the coastal rockwork. 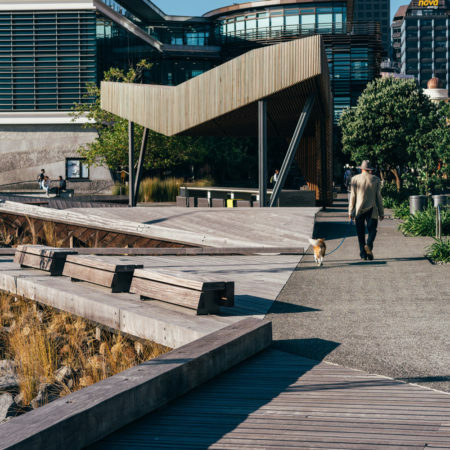 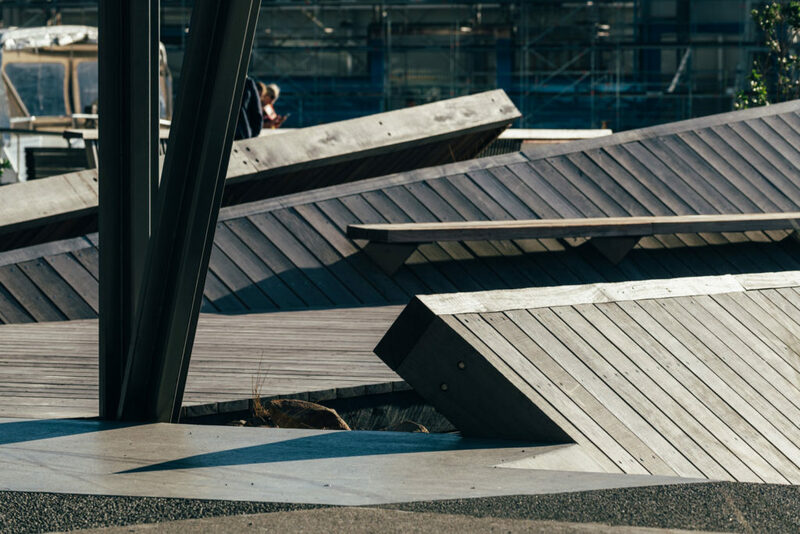 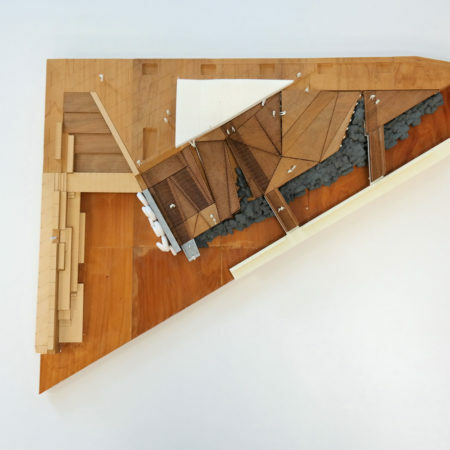 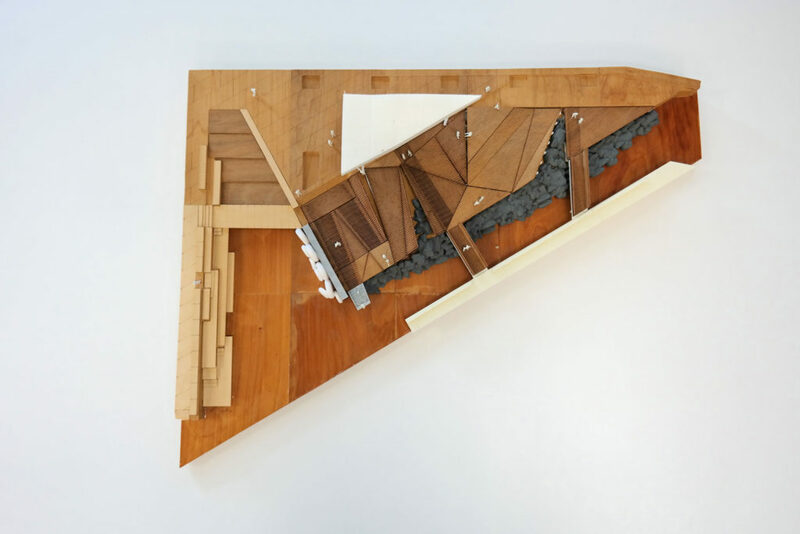 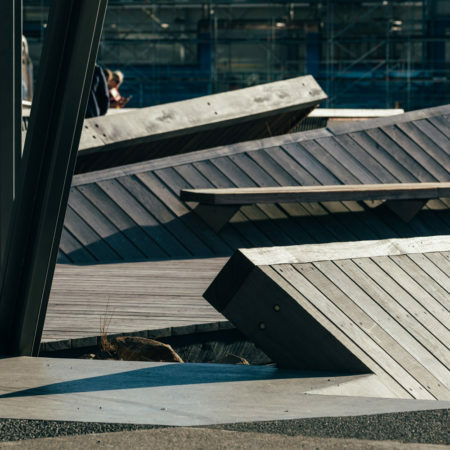 A folded hardwood timber deck forms the ground plane, its triangulated angles speaking to the ever-present tectonic forces that underlie this reclaimed waterfront site. 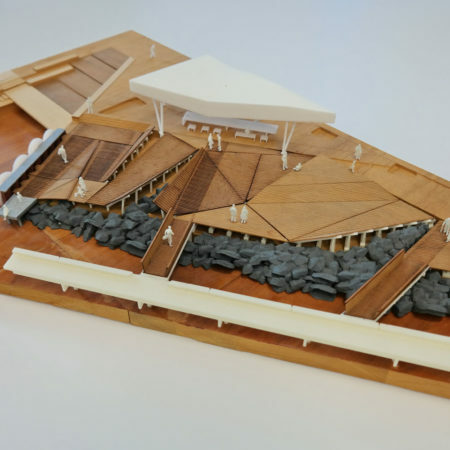 At the same time it is playful in nature, creating a landform that floats above the coastal edge, and opens up to create space for the coastal ecology to burst through. 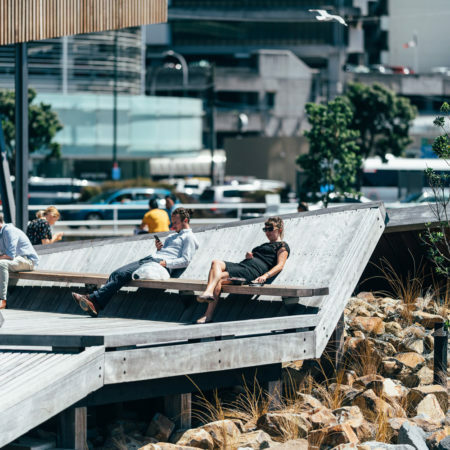 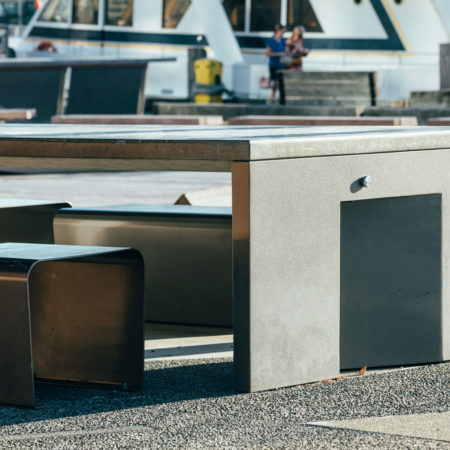 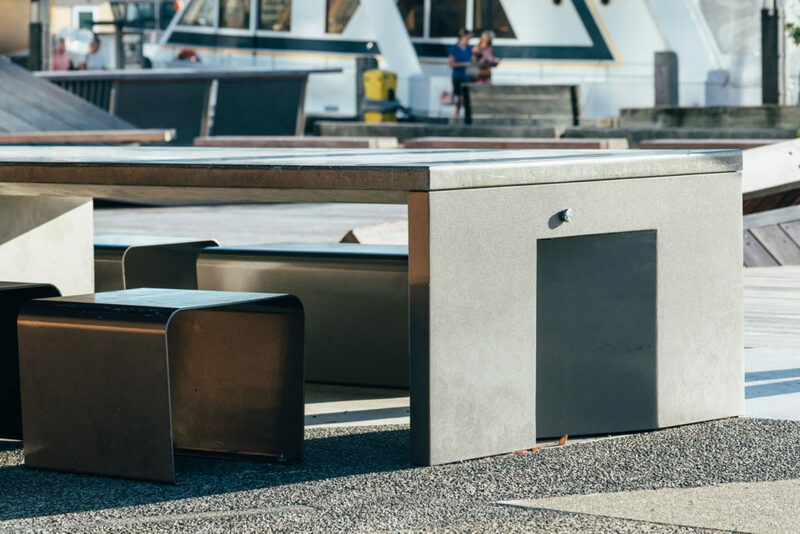 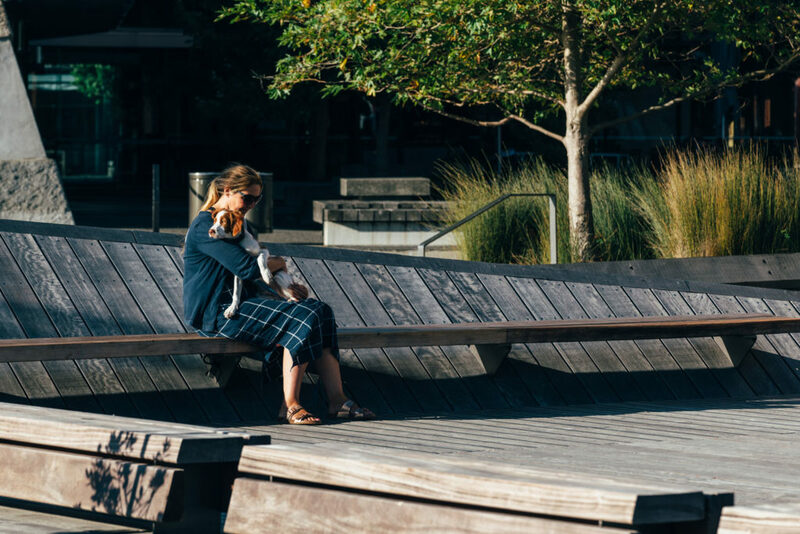 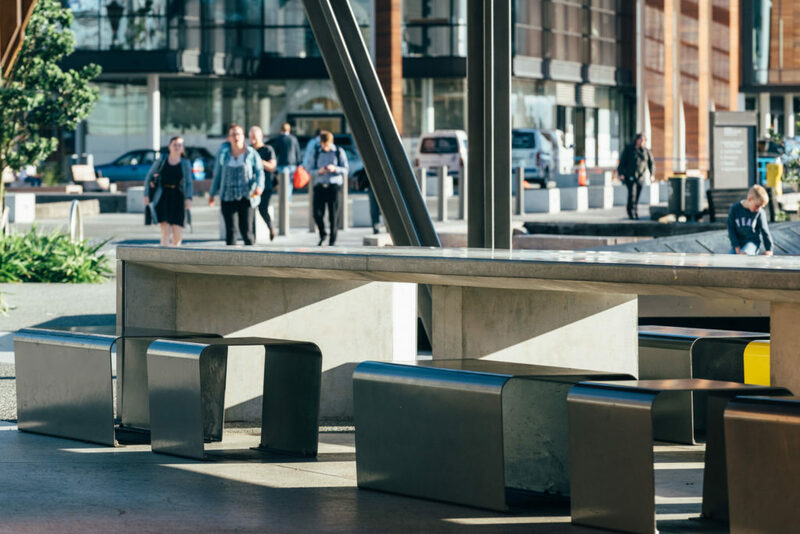 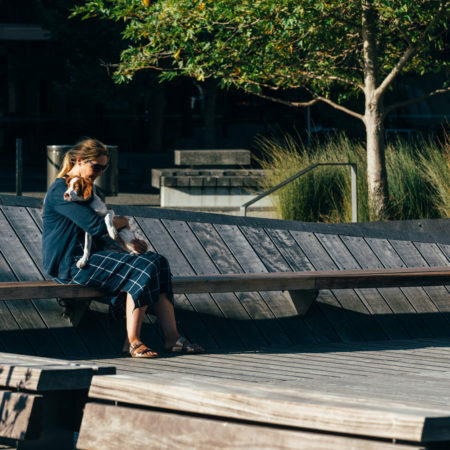 The space is designed to encourage social interaction, seamlessly integrating seats into the folds of the deck for users to tuck themselves out of the wind or bask in the sun. 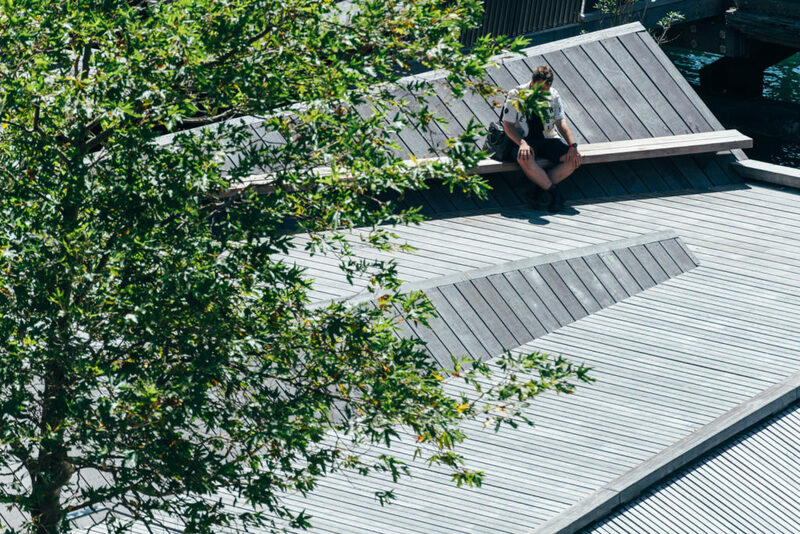 The angles and folds have proved popular with teenage mountain bikers and parkourists who challenge themselves on this new topography. 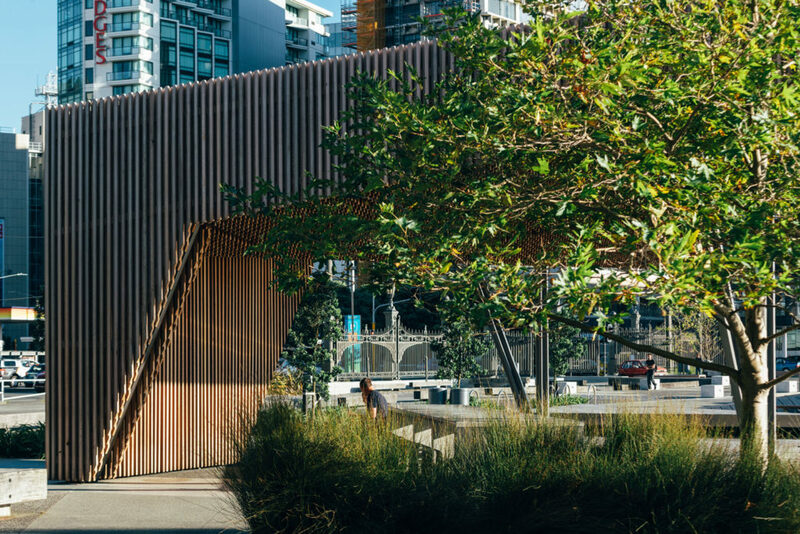 At the back corner of the space, against the laneway, a timber pavilion was born out of the upward abstraction of the folded ground plane. 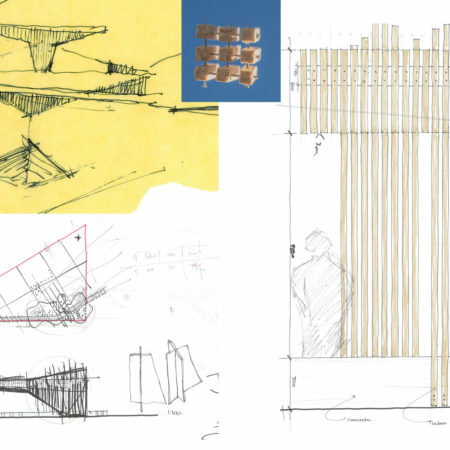 The surface undergoes a distillation to lightness as it is transformed into an overhead canopy casting dappled light while providing shading and visual containment. 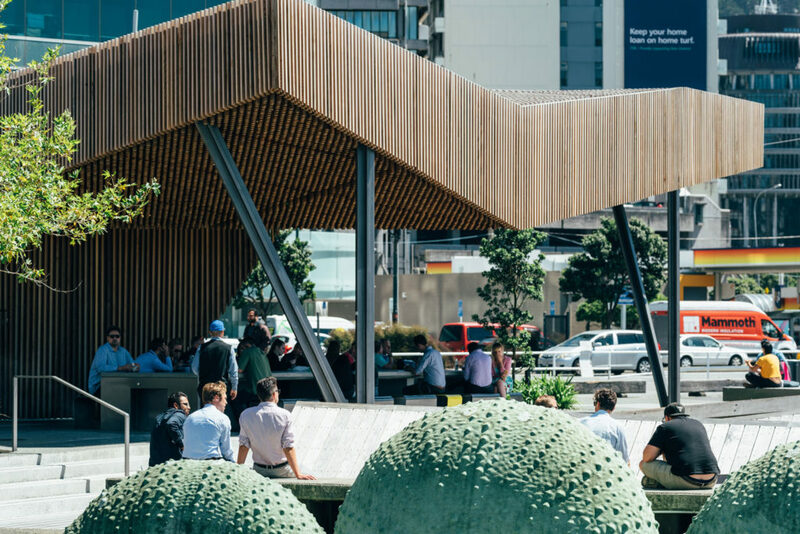 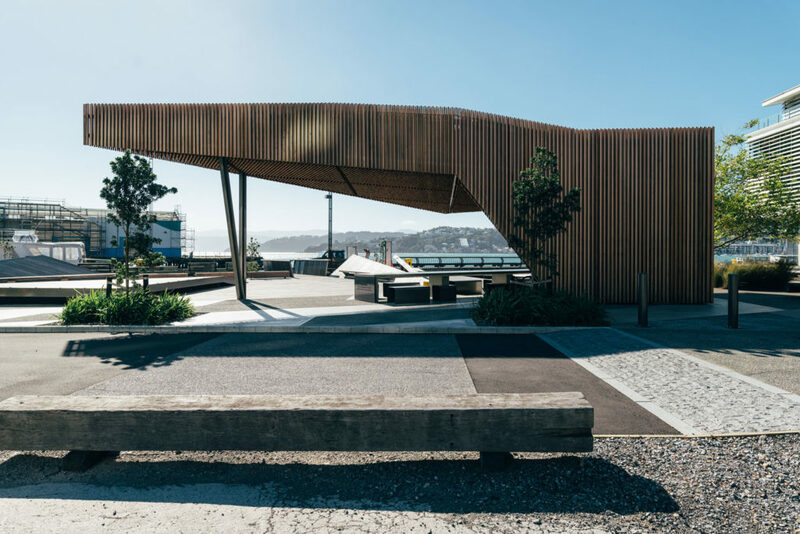 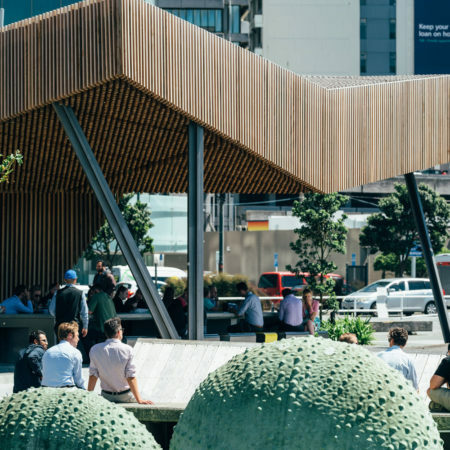 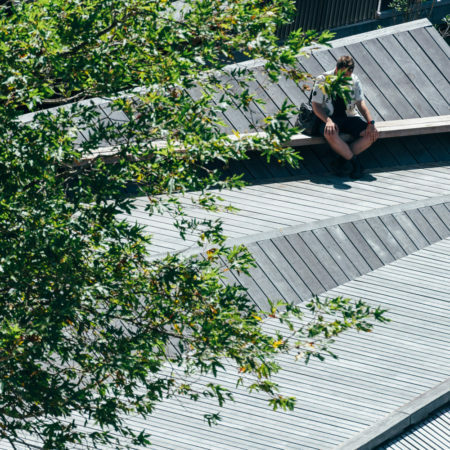 Fashioned from a matrix of vertical cedar battens the building is the symbolic interpretation of the much-loved coastal tree, the pōhutukawa. 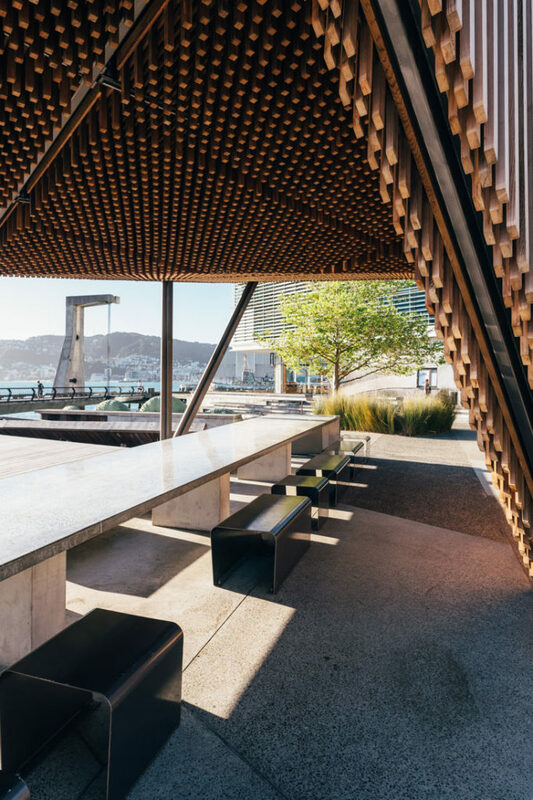 Beneath this permeable canopy a community dining table hosts gatherings of strangers in the place where the land meets the sea. 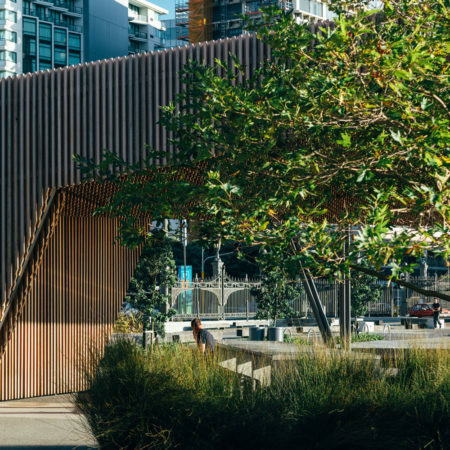 The building ‘breathes’, intimately connected to the weather; like a tree it provides only partial shelter from the wind and rain. 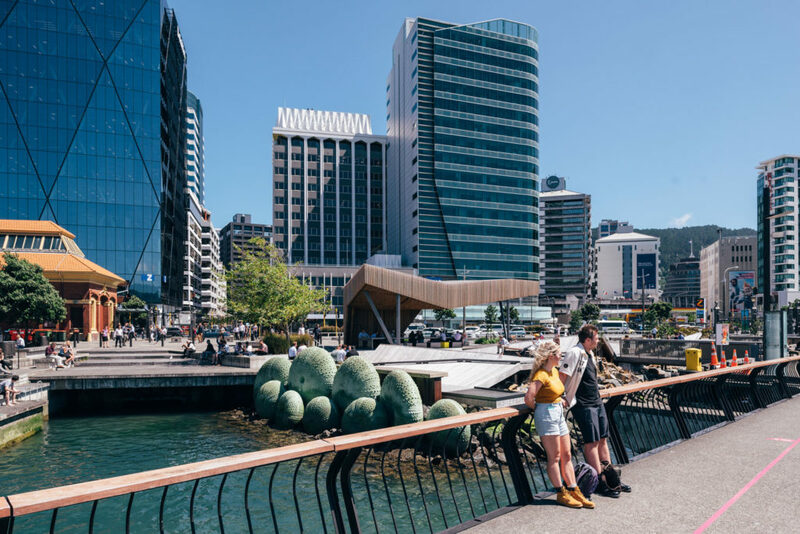 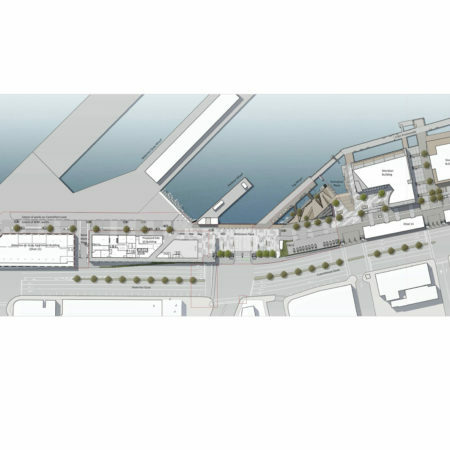 Kumutoto has extended the precinct as a vibrant mixed-use area that is accessible to all as a gateway to the waterfront. 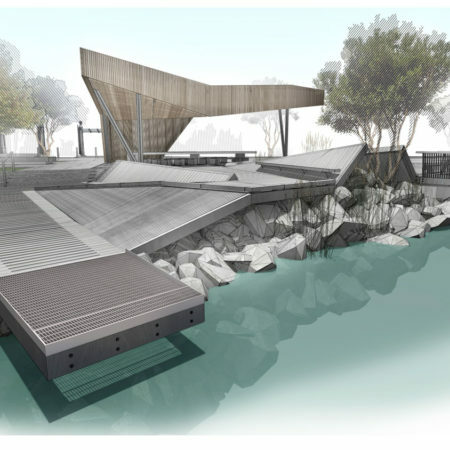 It supports diverse activities such as social gatherings, play, eating lunch and visits from the local marine wildlife. 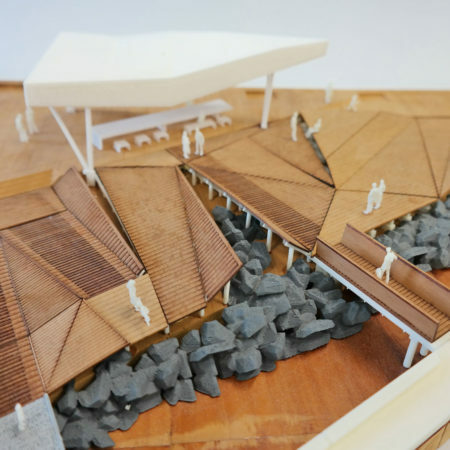 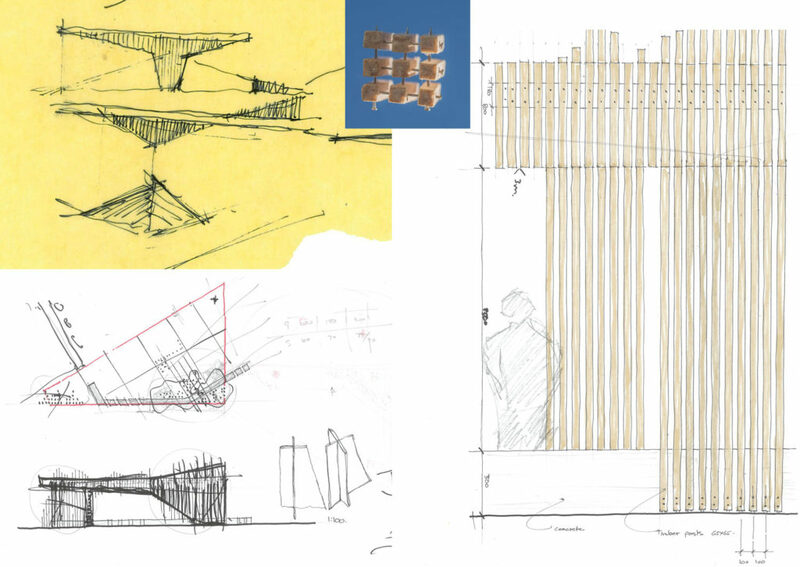 Above all, the success of Kumutoto is derived from both its flexibility and the way it incorporates the characteristics and materiality of the pre-existing working waterfront. 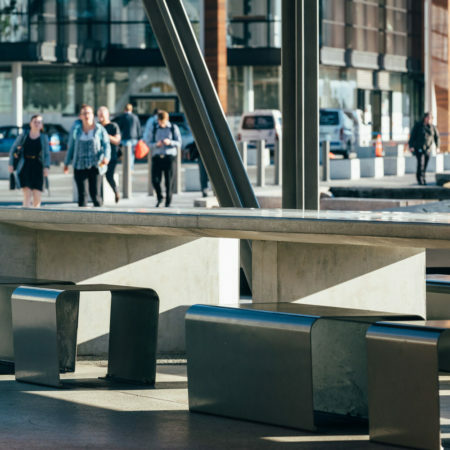 Although it is a new and totally unique space, it is also familiar and appropriate. 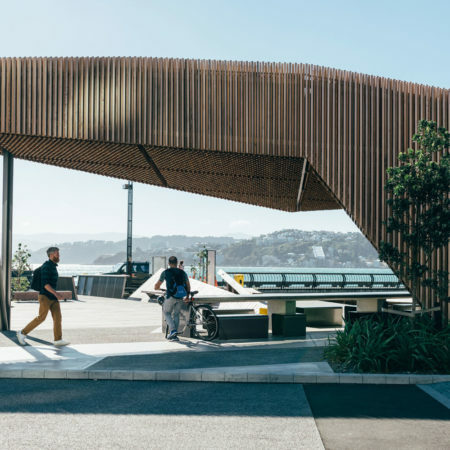 It fits in, totally of its place, at the edge of the city, at the edge of the world. 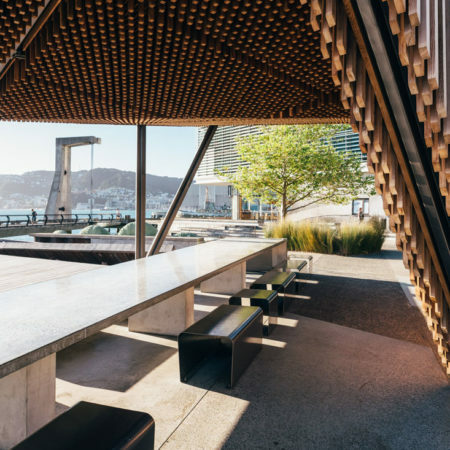 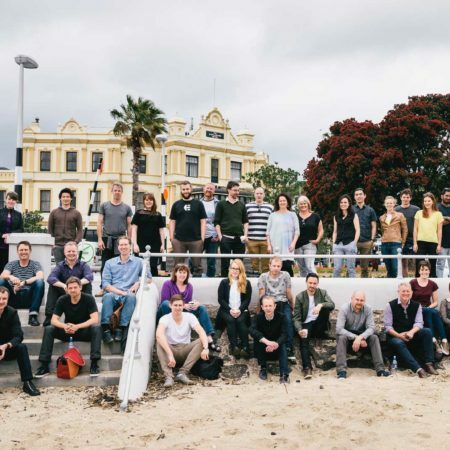 Project location: Wellington Waterfront, New Zealand.